Meat and cheese ... the perfect smart carb combination. Add a low carb tortilla and you’ve got a basic quesadilla. But you can deliver a lot more taste by making a few adjustments. Boost the chicken’s flavor by blackening it, starting with coating the breast meat with Cajun seasoning and then cooking until the skin is crusty. Coat chicken with Cajun spice blend. Saute in oil in a large saute pan over medium heat until blackened, 4–5 minutes per side. Remove from pan, rest 5 minutes, then thinly slice against the grain. Assemble quesadillas. First, coat a nonstick pan with cooking spray and heat over medium. 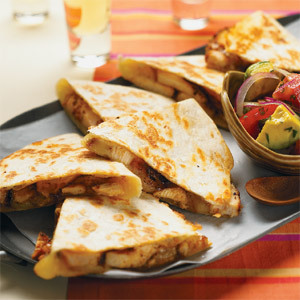 Place tortilla in pan and sprinkle 1 side with 1/4 cup cheese, sliced chicken, and another 1/4 cup cheese. Fold empty side of tortilla over and cook until golden on each side, 2–4 minutes. Repeat process with remaining tortillas. Slice into wedges and serve with salsa. Season chicken by rubbing Cajun spice all over. Saute breasts in oil until crusted and cooked through. Put down layers of cheese, chicken, and more cheese on side of the tortilla, then fold over and saute. Elevate canned refried beans to a whole new level with the simple addition of whole beans and salsa. Love guacamole? This fresh salad version is perfect with a rich and spicy Latin dish of your choice.